Travelling with a baby wasn’t easy, and it’s certainly tougher now that she’s a toddler, but that does not mean we intend to travel without her. A little more luggage weight, a little less on the itinerary, but a whole lot more laughter and love from the people around us. Humblet points out things we would not have noticed, and she brought us lovely surprises, like seeing the sunrise since she was up at half past five in the morning. 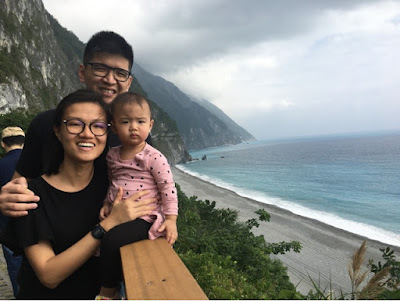 Here’s Part One of the Taiwan post, and I must say, it’s a wonderful place to bring your children. We took a Scoot flight at noon and landed at Taoyuan International Airport around five in the evening. After we picked up our luggage, we headed down to the convenience stall for onigiri and fishcake sticks with hot soup for a quick dinner whilst waiting for our driver. We had arranged for a driver way in advance, as we didn’t want to be stranded in evening traffic, with a cranky baby and no idea how to get to our lodging. Thankfully, the driver was familiar and fast. Getting us to our very pretty homestay by half past seven in the evening. The owner, Jonathan, was all ready to receive us and he had even prepared a baby bath tub and mosquito repellent for humblet in advance. No one ever has had too much good service. We turned in as early as we could as we were all tired from the flight. It was our first time to Yilan and we had no idea where the places of interest were and what we could do with a toddler. Sure, we did our research, but nothing opened at seven in the morning. Thankfully, our kind homestay host had bicycles and even one fitted with a toddler seat. He gave us directions to the nearby riverside park and that’s how we went about sightseeing bright and early our first Taiwanese morning. Breakfast was an amazing homecooked meal paired with a steaming pot of sweet potato porridge. Humblet was not the only one gobbling down her food that morning. Spring onion pancakes, egg crepes, smoked duck salad and a fruit platter. An impressive spread for a humble six-room homestay. The bulk of the day was touristy with the help of a local driver. Drivers in Taiwan are expensive, so be sure to hire a local for a slightly more affordable rate. We paid ours about SGD$100 for the whole day. He brought us first to the Luodong Forestry Reserve, where we walked about on ancient train tracks and explored the old timbre factory it was under Japanese Rule. Unfortunately, more than a third of the place was underdoing construction, so we couldn’t go around the whole place. Nonetheless, we got to collect stamps and have some gourmet sorbet before we left. Lunch was at a children’s café. This was a first for our family. We were quite disappointed that the driver had brought us there actually, because we explicitly said to bring us to local food places. But he had specially researched some places suitable for a toddler beforehand and this was one of them, so we decided to make the best of it. Humblet was a good sport, and although she was too small for most of the toys and the giant indoor slide, she tried everything at least once and ate the strange fusion food without a fuss. Following which we went about the famous Jimmy Square near Yilan Station, where his illustrations were brought to life through paintings, life-size statues, and wall murals. Nearing her afternoon nap time, we slipped into a quiet second-hand bookstore to enjoy some coffee and light reading. 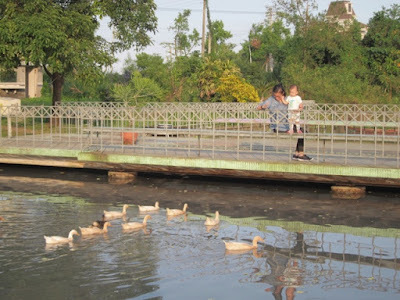 Later in the afternoon, we were brought to a Children’s Farm where kids could feed a variety of farm animals, including ducks, rabbits, goats and even baby pigs. Mya was much too frightened to go near the animals, much less feed them. But we thought that it was a great experience for her to have. It taught us that we need to be more intentional exposing her to different animals. Our final stop for the day was the Loudong Night Market. When in Taiwan, every night is Night Market night. Freshly made Spring Onion Pancakes, bubble tea, oyster omelette, lamb mee sua, bittergourd juice and the list goes on and on and on. We may be terrible shoppers, but we are great eaters, our toddler included. Dipping her finger in all our drinks and pointing at all the food stalls, we are so grateful she’s a foodie too. 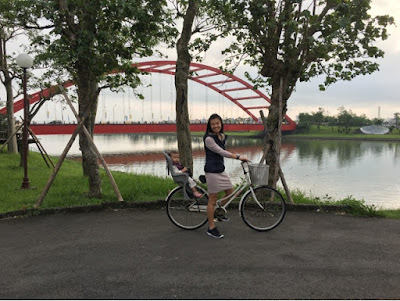 After another early morning cycle, this time around the barren rice fields and low rise houses, and another epic breakfast we were off to Hualien. To save cost and take in the scenery, we had booked train tickets online way in advance. Hiring a driver to Hualien would have costed us another SGD$100, but taking the train only cost us SGD$10 each, humblet went free. In fact, kids go free all the way until the age of six. This is where we booked our railway tickets - Taiwan Railways. Like excited foreigners we stood in the train store forever, deliberating what to buy for the ride. Ending up with an assortment of rice rolls, fish cake sticks, snacks and packet drinks for a mere fifty-minute ride. We booked the Taroko Express and were greatly rewarded having selected the Ocean Line. 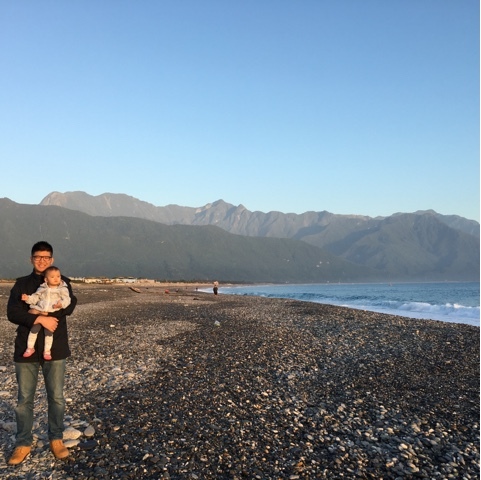 We knew we were approaching Hualien, when endless stretches of the ocean started to appear. It was beautiful, the sun was at its peak and the waters were absolutely glistening. We opted for a Hotel this time, because it was highly recommended by so many of our friends. Hotel Bayview was more than a worthy investment. Our room overlooked the Pacific Ocean and the famous Qixingtan pebble beach was a mere two-minute walk from the lobby with free bicycles for rent from sunrise to sunset. That evening we headed to the Night Market of course! There was only one at Hualien in fact, as the government had combined the initial four night markets into the huge Dongdamen Night Market, completely transforming the area, including a stage for local performers and a section for young people which had a rock wall and a skate park. That night, we ate way too much, Taiwan sausages, barbecue corn, seasoned meats on sticks, pepper pork buns, fried noodles and local fruits. That night, we went back with very happy bellies. 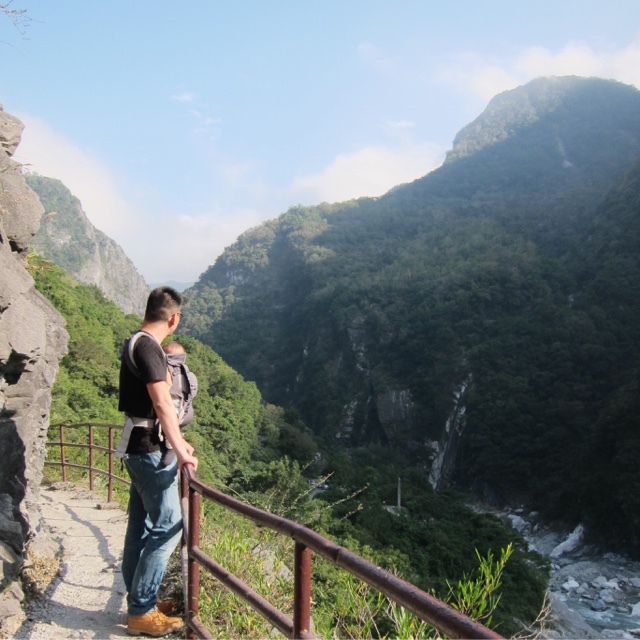 We opted for a full day Taroko tour with a recommended local driver. We were amazed by her knowledge of the area and her thoughtfulness. She managed to source for a car seat so we could be handsfree during the drive and humblet could rest in comfort. We couldn’t be more grateful. The Taroko National Park was amazing on websites, yet alone in real life. There were points on the mountain trek where we literally just stopped to stare. The boulders, running waters and insanely steep mountain ridges were breath taking. The cool early winter breeze and warm sunlight made the entire experience even more memorable. This was the day of the fateful five thirty morning call. But after getting us washed up and decked out in our windproof gear, it was nearly six. After we found a comfy spot on the beach, the sun was already elegantly rising right in front us. It was a chilly morning to be out at the beach, but to witness the sun rise on the beautiful pebble beach with the mountain ranges behind us, we quickly forgot the cold. Then it was off to breakfast and we were off to Taipei. The Taipei write up will be done in Travelling Toddler Part II. This post was too long already! 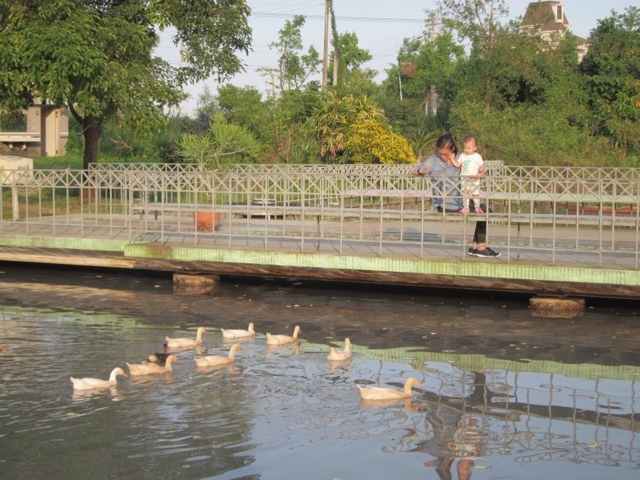 There will also be a Toddler's Guide to Traversing Taiwan later in the year. Fingers crossed! Have a great weekend, don't forget your umbrella! Thanks for this post i really enjoyed a lot this helped me really a lot to enjoy the post this is very much interesting one.